Limpopo River Lodge - Tuli Block Accommodation. 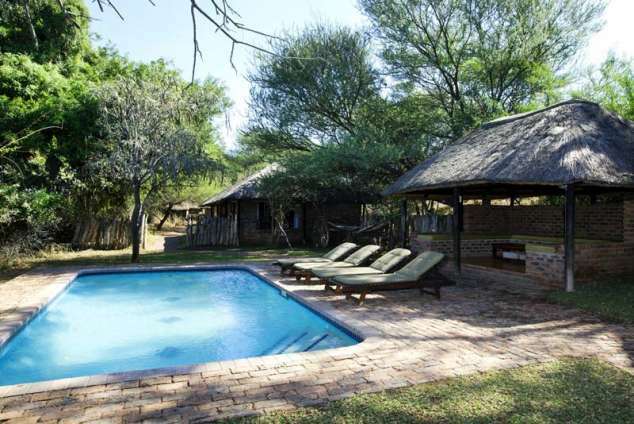 The Lodge is situated on the banks of the Limpopo River in the Tuli Block. A perfectly situated weekend getaway or overnight stop en route to central or northern Botswana. Only 12 kilometers from the friendly and little used Platjan border post. 5 Hours from Johannesburg and 5 hours from Gaborone. The land is undulated, scattered with koppies, covered with thick Mopane bush and a variety of indigenous trees. There are over 80 beautiful Baobab trees on the farm. An ideal setting for the nature loving family or a special group of friends to partake in nature's quiet peace and tranquility. The accommodation at the Lodge ranges from chalets to rondavels, camping and a bush camp. All of the accommodation is set along the Limpopo River and fully interacts with the bird life and wildlife that frequents the river. All the kitchens are fully equipped with cooking utensils, crockery and cutlery as well as refrigeration. We supply all linen. To ensure that your stay is pleasurable our friendly staff service the units and kitchens, so all you need to do is to bring along your food and drinks. There is extensive game on the farm including antelope, elephant, leopard, cheetah, hippo, crocodile and a variety of other species. The bird life is prolific and sightings of Pels Fishing Owl mean plenty of excitement for birders. Although there are no resident lion prides they regularly move on and off the farm. This is a self-drive private game farm, there are maps of the farm available at the lodge and responsible self drives are allowed. There is no petrol or supplies available at or near the lodge. Last filling station Sherwood or Bobonong depending on the route chosen. 29636 page views since 06 Feb, 2008.